I’m currently lovin’ on kale. 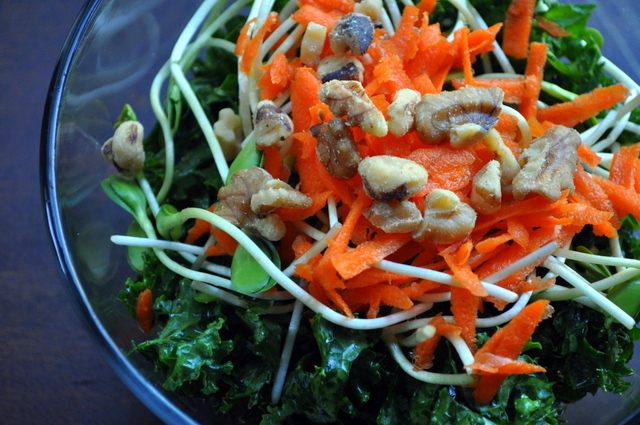 Kale salads just make my day. Sadly, yes a salad just makes my day. In this recipe I’ve added Bragg’s Liquid Aminos. This is a no table salt added flavor enhancer. It’s a liquid protein concentrate that is derived from soybeans and is simply essential and non-essential amino acids. I add this secret ingredient to everything for two reasons. One, it’s a salt-replacer that you can add to any recipe, as it acts and taste similar to salt as it enhances the flavor of foods. Two, add this to your foods and taste an outrageously wonderful difference. Flavors will pop. Lately I’ve been adding it to all of my meat dishes, veggie scrambles, and salads just to kick them up a notch. Trim the leaves off of the kale stems and rinse thoroughly, discarding the stems (or save them for juicing!). 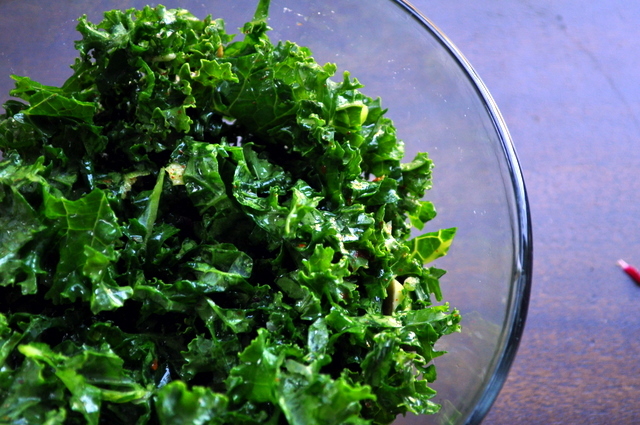 Slice the kale into very thin ribbons, placing kale in a large bowl. Add the salt to the kale and using your hands, massage the kale until it starts to wilt. 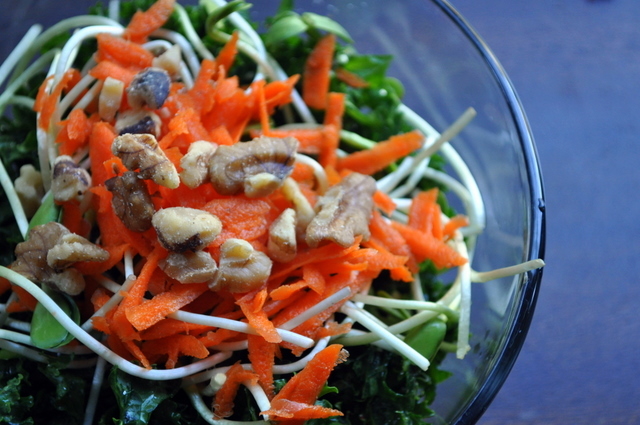 This step helps with easier digestion, and ofter texture of kale. Add the remaining ingredients to the kale and toss well. The possibilities are endless for this salad. You can’t go wrong. Speaking of kale, anyone else’s garden exploding with kale? So happy! 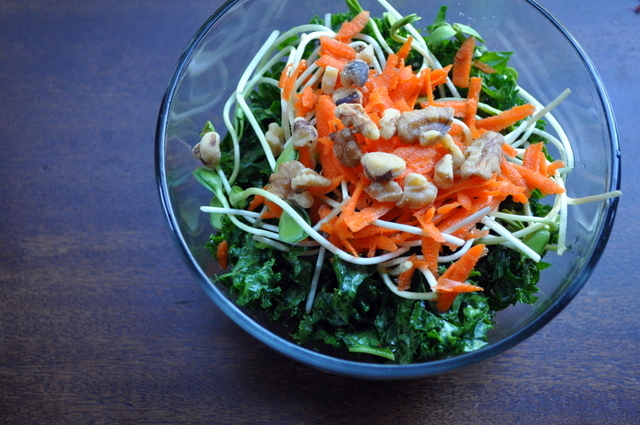 looks amazing- a perfect kale salad! I am waiting for the day till I can grow it myself! Braggs is NOT healthy. It contains MSG. Check out this website and you will see.. http://www.essentialoilcookbook.com/html/fascinating-braggs.htm. Low-sodium tamari or coconut aminos are a much healthier option. This is the first year I didn’t grow kale in my garden, but I did buy a “salad bowl” from teh campus greenhouse that has kale in it. Soon, baby. Okay, I’m reading your comment above….you lived off the salad bar in college? Man, we were so different. I lived off junk food. Literally. Ooooo, good call on the Bragg’s Aminos… I always forget to use it! I literally use Bragg’s Aminos on EVERYTHING. Such a great flavor-booster! Ahhh! I miss kale! Eff you dorm life. Oh I remember dorm life… NO healthy foods to speak of. I lived off of the salad bar at the all-you-can-eat dining hall. Next post: The Kitchen Is My Palette. The Crock-pot Is My Art.